The name Bullen is believed to come from the French Channel port of Boulogne and the first Bullens came to England after the Norman Conquest in 1066. There was great variety of spellings of the name in early times including Boleyn, as in Anne Boleyn, one of the wives of Henry V111. Her family had a home at Blickling, which is not far from Trunch. The first Bullen family that I have come across in Trunch is that of Samuel Bullen (1791-1870). He was born in Witton, a small village near Trunch, but was living and working as a carpenter in Trunch by 1828. He was married to Mary and they had 5 children - William, Maria Ann, John, Thomas and Jemima. Samuel ran a carpentry and wheelwright business in Chapel Road, helped by his son Thomas. Son John married Sarah and ran his own carpentry business in Warren Lane. One of his children - Alfred, moved away to Middlesborough and was the ancestor of David Bullen who married Ann. Samuel and Mary's daughter Jemima was single until she was 52 and then she married William Seago in 1886. I think they lived in Dudley House on Chapel Road, now the Farmhouse. They were married for 27 years and it was obviously a happy marriage as Jemima was buried in 1913 as a "beloved wife". It was son William who headed the family which was to become the famous Bullen well-sinkers of Trunch. He lived on the Hill working as a carpenter and wheelwright and it was his son Alfred who started well-sinking when he took over the business after his parents' deaths. 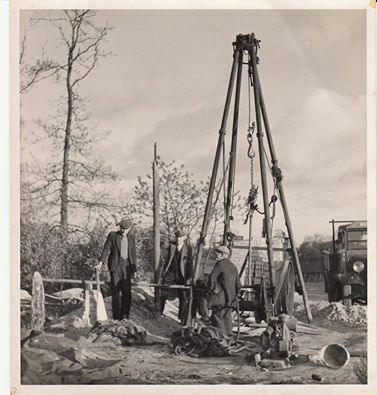 In their turn Alfred's sons Herbert and Horace were also well-sinkers and in Arthur Amis' book there is a photograph of them working in 1959. One of the Bullen boys came to a sorry end when his foot was caught in a threshing machine in 1868 and although he was taken to hospital in Norwich, he couldn't be saved. On a happier note there was a funny story in the newspapers in 1950 when Horace Bullen went 6 miles to Hanworth with a 25 foot ladder to rescue a cat that had fallen down a well. He found the well was 50 feet deep but still managed to rescue the cat! It is thought that the picture on the left includes Horace Bullen. That on the right shows Horace and Herbert Bullen, Norman Fuller and Herbert Flaxman boring out a barrel for a pump. Keith Gotts, writing on Facebook, remembers Horace living in Chapel Road and says that he was quite wealthy. Obviously the well-sinking was successful. Some of the BULLEN family moved to Middlesbrough in Yorkshire in the late 1800s, including Alfred (born 1850) an engine fitter, John a joiner (born 1825), and Thomas a carpenter (born 1827). Later Alfred (born 1879) joined the Royal Navy and was in Malta in 1901 but he was back in Mundesley by 1911. 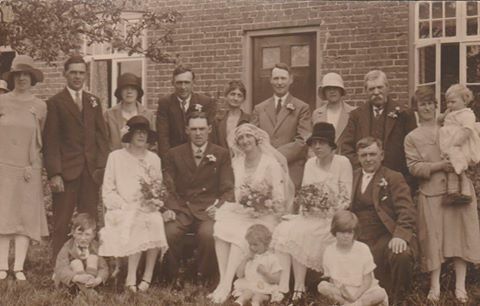 Back row (L to R) Maud Bullen, Herbert Bullen, Mrs Church, Horace Bullen, Mrs Ellis, Mr Ellis, Ruth Seaman, Alfred Bullen, Helen Bullen, Dorothy Bullen. Front row - Geoffrey Bullen, Barbara Bullen, Miss P Church. 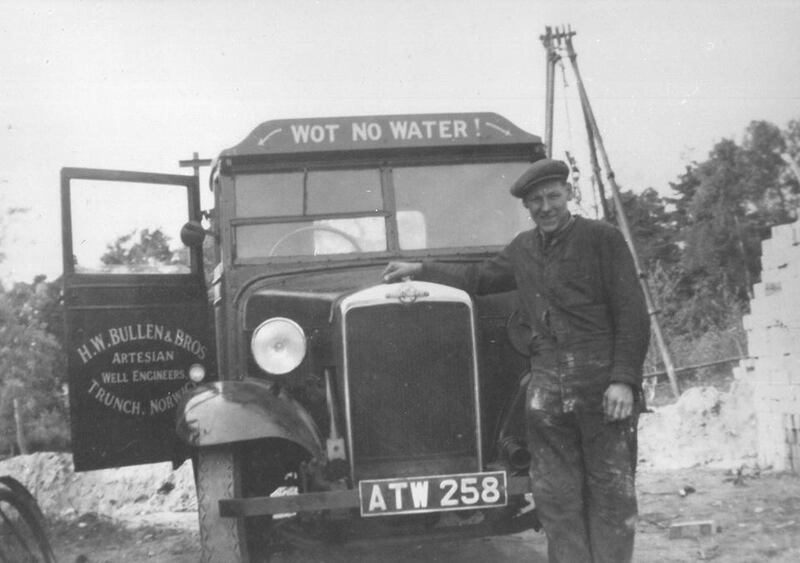 Herbert Flaxman with the Bullen's lorry in 1950s. ​Click here for more about wells in Trunch.